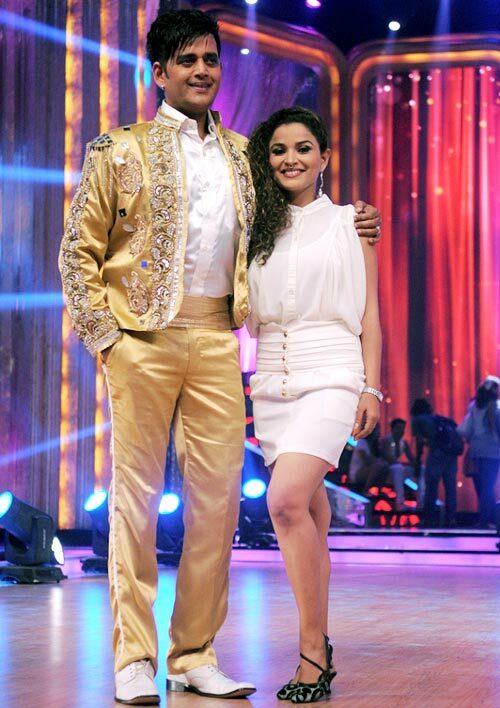 Rediff.com » Movies » Jhalak Dikhhla Jaa stars set the stage on fire! Jhalak Dikhhla Jaa stars set the stage on fire! Colors a television channel of Viacom 18 production house will soon start airing the hit celebrity dance reality show Jhalak Dikhhla Jaa. The show is all set to enter its fifth season as it goes on air on June 16. Fashioned after Dancing With The Stars, the show features Indian celebrities as contestants who compete for the winning prize using their dancing skills with the help of a choreographer. The top 12 contestant of set to take part in the show's new season speak to Rajul Hegde about the show and how excited they are to be in it. Shibani Dandekar grew up in Australia but is currently pursuing a career in Mumbai, like her actress-singer sister, Anusha Dandekar. She has done television work, modelling and hosting events. Since 2011, she has been co-hosting the TV show Extraa Innings during the IPL matches. Watch Shibani Dandekar dance here! Giaa, the docile Gopu Bahu on Saath Nibhaana Saathiya, left the popular show after she decided to be part of Jhalak Dikhlaa Jaa. "I'm very excited. I always wanted to do Jhalak. It is the best dance reality show. I am not a trained dancer but I am working hard. I don't know how good a dancer I am but I guess my choreographer can answer that question." Watch Giaa Manek dance here! Isha Sharvani debuted in Bollywood with Subhash Gahi's Kisna. She began training in dance at the age of seven with her mother, Daksha Sheth. Kalaripayattu, Kathak and Chhau are part of her repertoire. Isha is also a trained acrobat. She has performed in 22 countries over the last seven years. "It's a challenge to perform on national television when the whole country is going to be watching and judging you. "It's also a challenge learning a new style and putting it to the test in just a few days." What was her mother's advice? "My mother has told me to forget about losing or winning but to enjoy the dance. I should be proud of it even if I look at it after 10 years. For me, too, that is important," she says. Watch Isha Sharwani dance here! Darsheel Safary, who became very popular after playing a dyslexic child in the movie Taare Zameen Par, is in Shiamak Dawar's dance group. He has always been keen on showcasing his dancing talent to a wider audience. "I now have a better platform to show my dancing talent to the world. Acting is my first love and dancing is my second," he says. Is he nervous being the youngest contestant on the show? "Yeah, a little bit. I will practice hard and will manage to overcome it soon," he says with a smile. "Jaykumar motivates us to give our best performance on stage saying, 'Todo, fodo, dhoom machao!' His way of choreographing our dance performances is just bindaas." Darsheel has been paired with Avneet Kaur in the show and their dance will be choreographed by Jaykumar Nair. Watch Darsheel Safary dance here! Actor Pratyusha Banerjee -- Anandi in the teleserial Balika Vadhu -- is a trained dancer, but still, she says, "the dances I am learning are tough, though exciting. I love to dance and sing and hence I am here, without a sense of it being a competition." "I am a little bit nervous because Madhuri Dixit, who is such a great dancer, is one of the judges of the show." Watch Pratyusha Banerjee dance here! Gurmeet Choudhury, who played the role of Lord Ram in Ramayan, became popular for his romantic pairing with Drashti Dhami in Star One's Geet. Apart from Jhalak...he is also in Zee TV's Punar Vivah. "I am blessed with an amazing choreographer and we are trying our level best to deliver," Gurmeet says. "Debina (his wife) joined us for the rehearsals and it was the most disastrous day as two ladies (Debina and Shampa) came together and made me dance on their finger tips." Shampa Sonthalia is his choreographer partner. She was paired with Sushant Singh Rajput in the last season of the show. Watch Gurmeet Choudhary dance here! After tickling our funny bone for many years now, stand-up comedienne Bharti Singh is all set put her dancing skills to test. "Dance is my passion and I'm getting a chance to fulfil it through Jhalak Dikhhla Jaa," she says. "In Comedy Circus, I've entered the show many times dancing, so I feel very blessed to be a part of it." Will the extra pounds she carries be a problem? "Initially I thought I won't be able to dance, but my choreographer is my life-saver. He made me understand that dance has nothing to do with body weight. It is only about some technicalities," says the feisty lady. 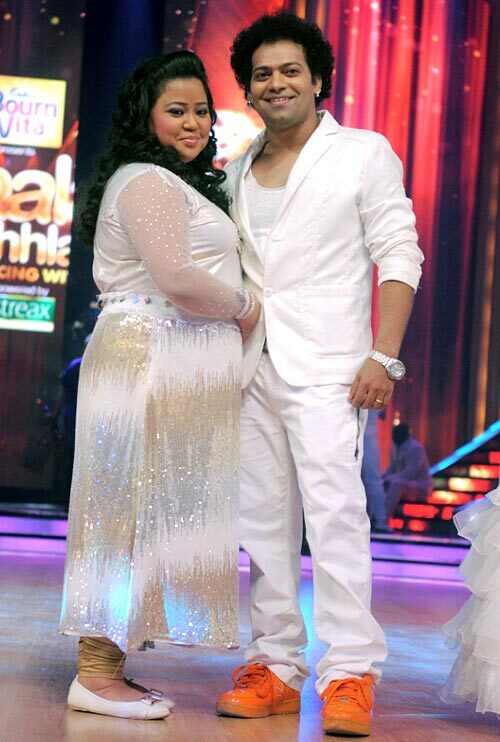 Watch Bharti Singh dance here! Bhojpuri movie star Ravi Kissen says he is on Jhalak Dikhhla Jaa because of his daughter. "She felt I might embarrass myself as I have never danced in any other form than the desi one. "But Papa is a hero so I accepted my daughter's challenge." Watch Ravi Kissen dance here! Jayasurya says, "I was in two minds about doing the show. I haven't seen the show much and this is a totally different thing in my life. I thought a lot about it and decided I must take this challenge." He is discovering whether he has the ability. "I enjoy dancing but I am not a dancer so that is the problem. I have never danced before an audience. So I'm just giving it a try and let's see how it goes." Cricket, he says, is "much easier." Indian audiences are very supportive. "Like in the case of cricket, I have got a huge fan following here. I hope everybody will see this show and support me." Watch Sanath Jayasurya dance here! Archana won Channel [V] India's Get Gorgeous in 2004 and became a veejay on the channel. She hosted the second season of Get Gorgeous in 2005, followed by Extra Cover - Tour Dairy on Neo Sports, and IPL 5's Extraa Innings. What brings her to a dance show? "This is something different. I thought I've spoken a lot in my life so why not come out and dance and express myself? And learn different forms of dance. It's like my summer hobby." She finds it "unbelievable, dancing in front of Madhuri Dixit because we have grown up watching her dance." It's hard work, she says, but "much like presenting live on cricket because there is no room for mistakes, cent per cent concentration, and you got to go out and impress." Watch Archana Vijay dance here! Jayati is the familiar saas/bahu on several television shows. Currently, she plays the fierce 'Mataji' in Sasural Simar Ka. Jayati says, "I love dancing and I am raasta chaap dancer when nobody is watching me. I am good at that. But when it comes to technique or western dance forms, I want to be good at it and that's what drives me here." She adds, "I am a trained classical dancer but I am an absolute infant when it comes to western dancing." Watch Jayati Bhatia dance here! Popular ghazal singer Talat Aziz released his first album in 1979, and has been much loved since then. He has sung in movies such as Umrao Jaan and Bazaar. Now, Aziz will take his talent to the dance floor. Watch Talat Aziz dance here!